Too much wind.Too much snow.Too much danger. Too much unpredictability. Too much pain. what you love is your fate"
It's over for this time. But the fact that both Pawel and myself are alive and with all our fingers and toes in perfect condition and color might give us a hint about the rightness of our decision even if up there we felt that reaching the summit was possible. But what we couldn't foresee there at 7000m, was the price we should have had to pay for it. 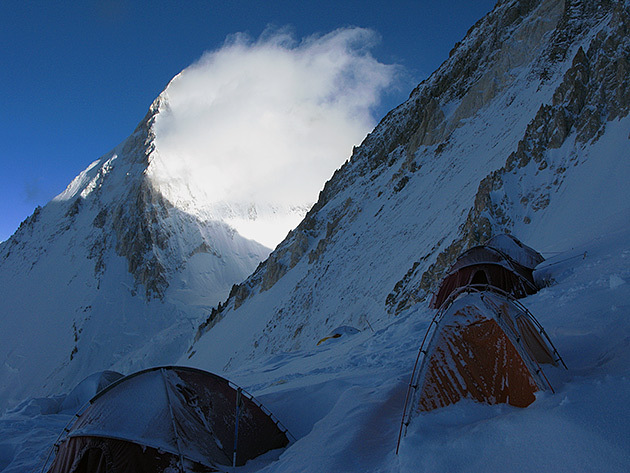 We might have made it to the summit or in its proximity but the weather window was simply much too short to have allowed us to safely get back to our tent in Camp Three. I reckon we would have needed around fourteen hours just to reach the top from Camp Three and maybe six more on our way back. The forecast coming from three different sources was perfect for making a bid to the summit on July 18th and 19th. On Friday night I was climbing the "Banana" ridge with Pawel up to Camp Two on an almost full moon. No headlamps were needed. We never turned them on. 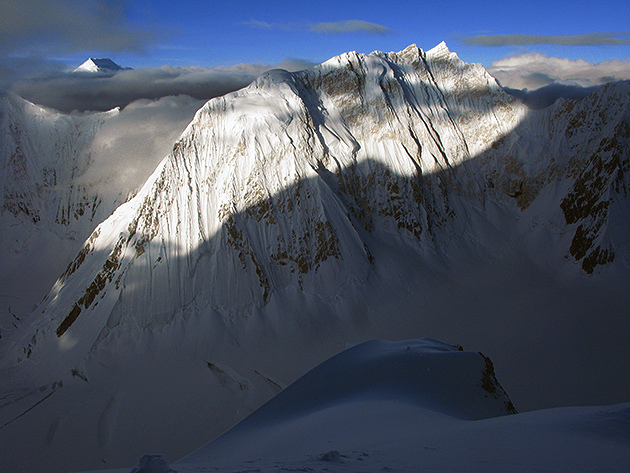 The light was somehow surreal and we were feeling confident and strong, making a fast progress. I think one of the most rewarding Himalayan experiences you can get is climbing an eight thousand meter peak in a small light party of two friends. On Friday morning I was climbing with Pawel towards Camp Three when we first met Gloria Brighenti descending and, after one hour, Simone La Terra and Hassan Sadpara, Gloria's high altitude porter. They were retreating after an unsuccessful summit bid the night before. That night, around twenty people tried in vain to reach the top in what was the second massive summit push of the season. Simone got feet frostbite while ending the summit pyramid traverse and wisely decided to turn back. On Camp Four he tried to use the emergency oxygen to speed up his blood circulation but the regulator was dead frozen. He only managed to do this after about two hours of trying to "reanimate" it. The gas has most probably saved his feet, as he told later in the base camp. Hassan also got frostbite but this time on his fingers. He and Gloria reached about three hundred vertical meters from the top when the strong wind and the deep snow made them turn back, not before digging a snow hole to protect them from the wind for about one hour. Black clouds started coming from the west and the mild snow fall from the morning got into a full blizzard while reaching the spot of the Camp Three at around 6900m. The spindrift was merciless beating my face and the area around my neck got wet and hellish. Last year on this mountain I had reached one hundred meter less before retreating due to high avalanche risk.The blizzard lasted all the day and Pawel was worried that our tent, including ourselves inside, would be blown down the mountain. We had already got very concerned about going down to Camp One after the heavy snow fall since the slopes will be loaded with fresh dangerous snow, waiting for an irresponsible climber to trigger an avalanche. The storm calmed down into the evening and, at around ten o clock, I told Pawel to turn off his headlamp since I was trying to get some sleep. Incredibly, it was not his lamp lighting our tent but a big round full moon outside. Nevertheless, some nasty clouds were still conquering part of the western sky. We spoke for some twenty minutes about what to do and decided to wait and asses the situation one more time early in the morning. 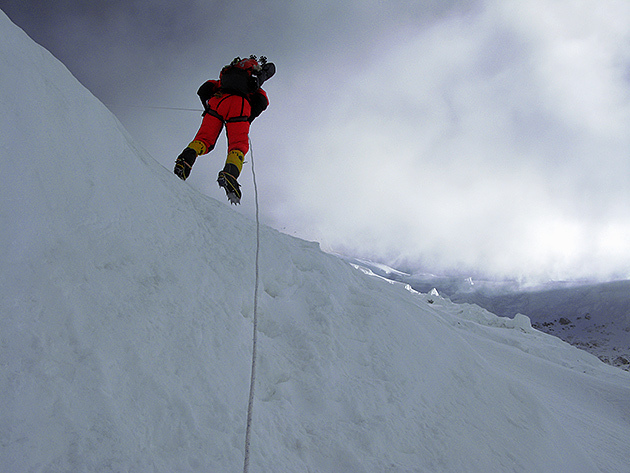 And if the weather was good and looked stable, we would have a try to the top. If not, we'd better descend as soon and as safe as possible. 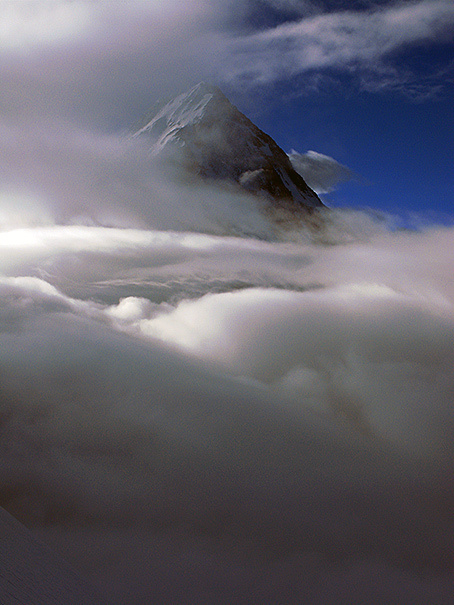 The next day came with high winds over 7000m and a sea of clouds bellow us. We could see the blizzard blowing the snow around the summit pyramid for distances of dozen of meters. It could have been suicidal to be around the summit in such weather. 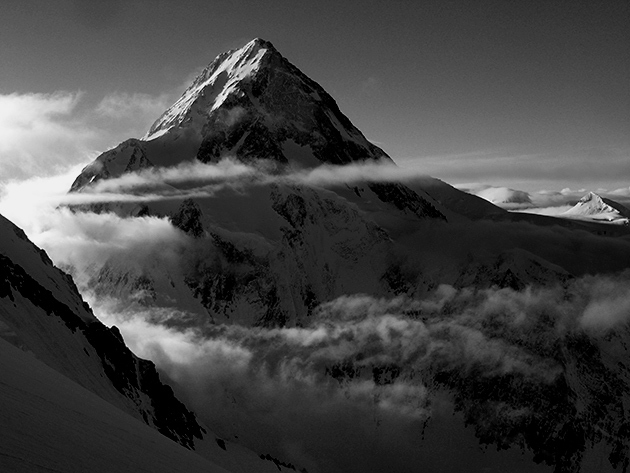 But something inside myself was desperately longing for the summit. 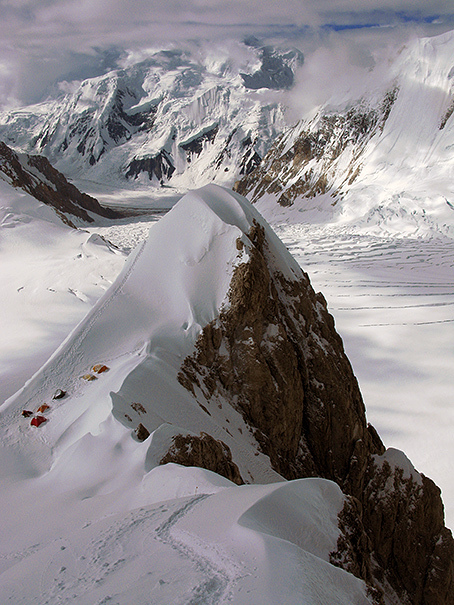 We took eleven hours of countless abseils and then descended over the ice fall till we reached the base camp in mild snowfall. 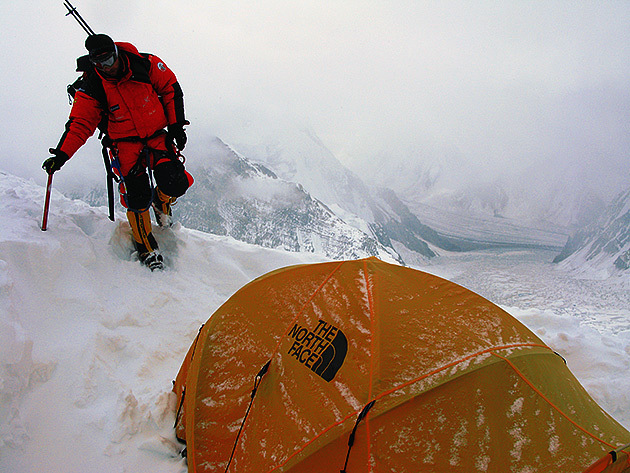 The same night, Finnish Veikka Gustaffson (twelve eight thousand meter peak summiter, the regular climbing partner of Ed Viesturs), Colombian Fernando Gonzales Rubio (with seven eight thousanders) and Spanish Esther Sabadell Simo (North Face Athlete, two eight thousanders) with Hassan, her high altitude porter, tried to reach without success the summit of the neighboring G1. Veikka retreated one hundred meters from the summit. 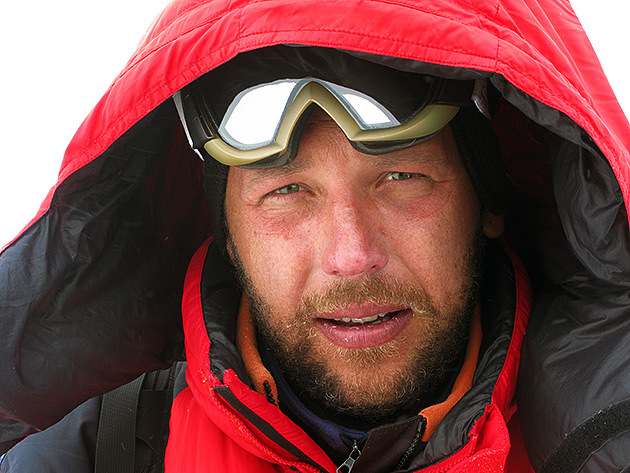 Fernando stopped at around 7600m when he felt the things were just not right to continue and Esther with her partner started to go down from around 7400m. Perhaps G2 is trying to teach me more things about the mountains and life than my three summit successes in less than two years on Cho Oyu, G1 and Makalu. Will I have the wisdom to keep my eyes opened enough for it? 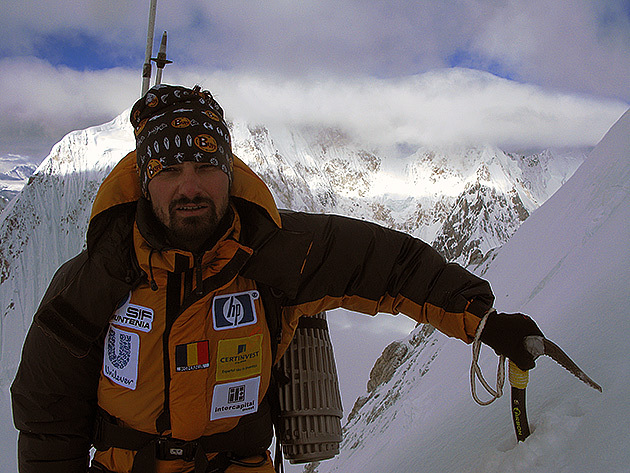 Between April 10th, the day I left Romania and the time being, two of the leading alpinists of our days that I personally knew and deeply admired and respected have perished in the Himalayas: Inaki Ochoa and Karl Unterkircher. 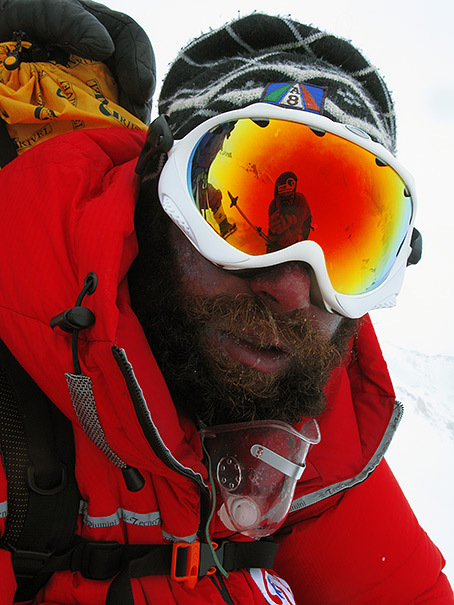 About Inaki I have wrote in my previous post named "Rescue in Annapurna." 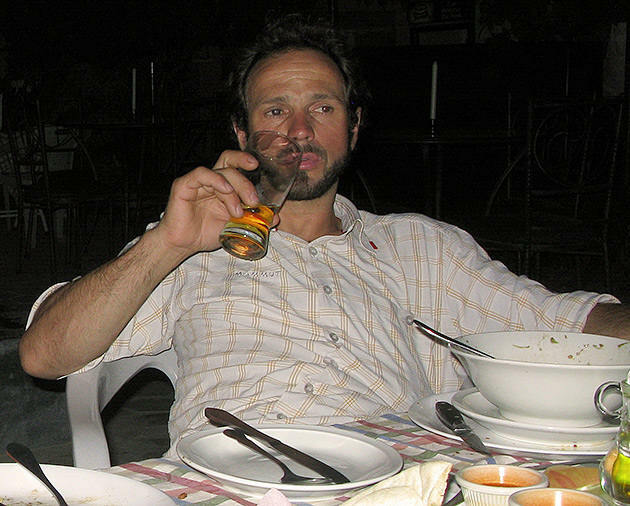 I just found out Karl Unterkircher has died July 15th on Nanga Parbat when a snow bridge collapsed while lead climbing. 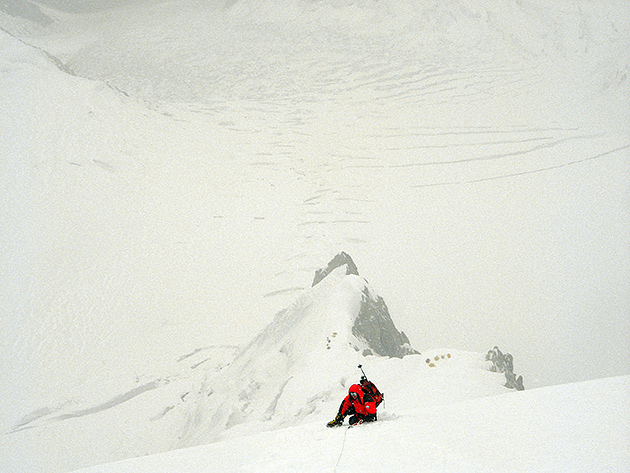 Karl, together with Walter Nones and Simon Kehrer were trying to open a new route on the Rakhiot face. The whole night has been uselessly spent by his two friends in order to attempt a rescue. Walter and Simon where then forced to resume their climb up to 7000m to exit the face because of the unsteady nature of the route they were on and the impossibility to down climb it. A massive rescue operation for Walter and Simon is now under way, performed by a big Italian team lead by 14 eight thousand meter summiter Silvio Mondinelli. 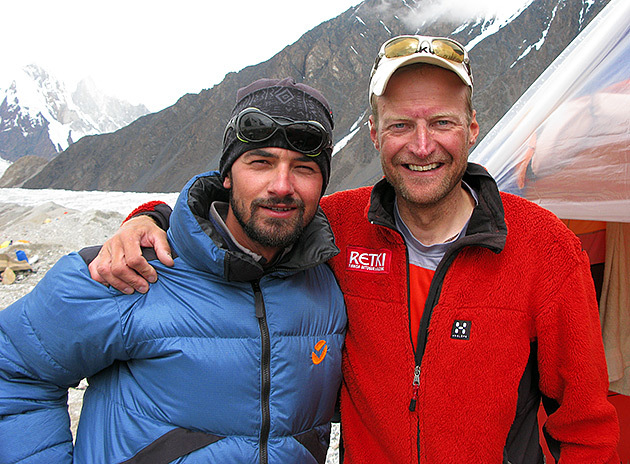 I just cannot forget Karl lasts words to me while leaving the hotel in Islamabad: "Alex, be careful... G2...as is a very dangerous mountain..." I first met Karl last year in the same place I am now, the Gasherbrum Base Camp. 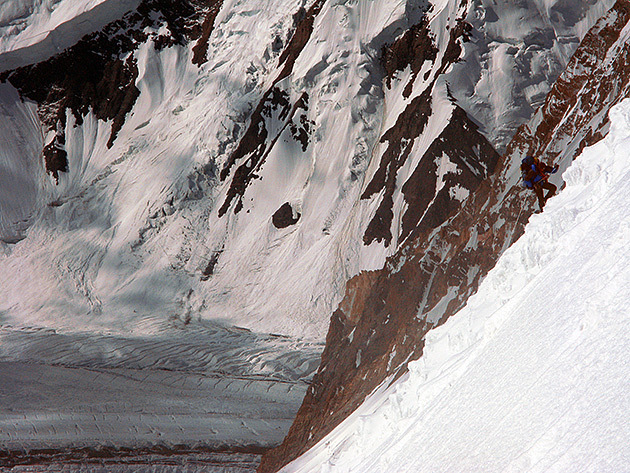 He just made history by making the first ascent of the Gashebrum 2 North Face, of which I wrote on my June 26th dispatch of this expedition. Some time you just meet some special people for a few very fleeting moments. And maybe you don't realize this in the beginning, but these encounters will remain with you forever. Because of the energy they give you, because of the inspiration you get. When enough is enough, it is probably time to temporarily back down and change the water. No matter if this is up high on the mountain or in the everyday life. Moutain is Mountain and His sovereignty is absolute. I'm now into the Base Camp at 5000m, lying on two chairs, Texan style, with a cup of amazing hot chocolate on my left side. 91% oxygen saturation in my blood. My beard has grown a lot. Maybe I'm looking more mature. But only looking. Sharing my thoughts. Outside there is a bit of wind. I feel the mountain bellow the foggy curtain. LIFE IS GOOD.